We left Bangalore to Agra by Karnataka Express and it took 36 long hours of journey. From Agra we hired taxi and went to Fatehpur Sikri which is about 45 km from Agra. Then we took bus to reach the fort which is about a kilometer away from car parking. Ticket charge is Rs 5 per person. 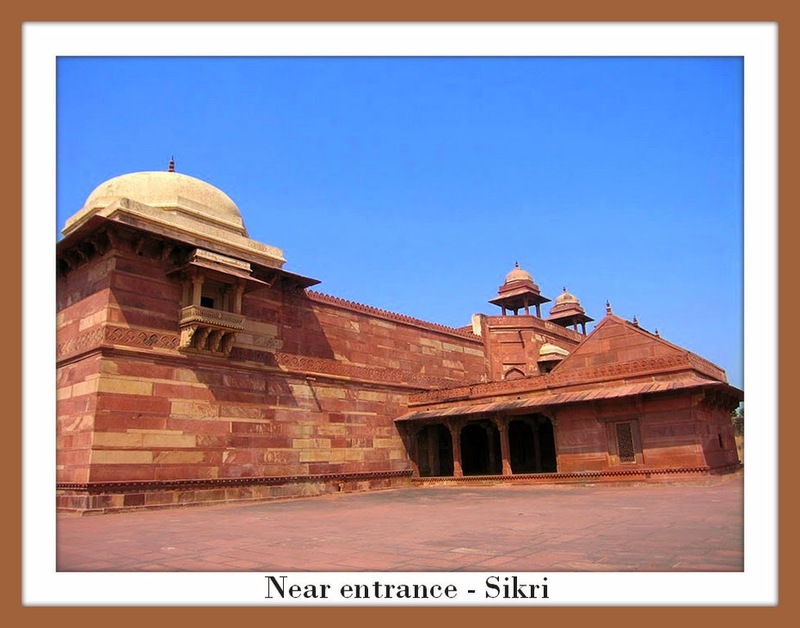 Fatehpur and Sikri are two different place opposite to each other and is at a walkable distance. The entry ticket for Sikri is Rs 20 per person except on Friday. On Friday's it is 50% less. Construction of fort in Sikri was started in 1570 and was completed in 1582 and was built using red sand stone. The first place inside the building is built by Akbar for his Hindu wife Jodha Bai who was from Rajasthan. There are 2 rooms, one is for summer and other one is for winter. It is built similar to Rajput style and there is separate room built for Jodha Bhai to worship. Next is her kitchen where outer wall are carved with different ear ring pattern of that period and below that there are different patterns in Persian style. After that there is place surrounded by water where Tansen used to sit and sing. Then we saw Sheesh mahal built for Akbar's Muslim wife Turkey Sultana which was built in Mughal style. Next, we saw Dewane-i-Aam where Akbar used to listen to the public gathering. One can see the Ludo game marking on the floor. In this game ladies were used instead of the pawns for the game. There are few more places inside the fort like school (Madrasa), Diwan-i-Kaas where Akbar with his 9 ministers (Navaratnas) meet for the important discussion, a lake which is now used as fields, hide and seek place where queens with other ladies used to play, ladies hospital, Meena bazaar a market place where they used to do shopping, Golden House for his Christian wife Mariam who was from Goa. Fatehpur is located opposite to Sikri, which has Salim Chisti's dargah and Buland Darwaza which is one of the highest gate in Asia. Fatehpur was named after the Babur the 1st mugHal ruler in India defeated Rajput Rana Sanga of Mewar in the battle.